Itad, as part of a consortium with the Institute of Development Studies, the International Food Policy Research Institute, BRAC Institute of Governance and Development, and the Center for Natural Resource Studies, delivered a process evaluation and cost-effectiveness assessment as part of the wider impact evaluation of an innovative hybrid programme linking nutrition-specific activities such as delivery of micronutrients and nutrition counselling to wider social protection and livelihood programmes. The final report, which features in the UNSCN news 42 and is available here, draws heavily from Itad’s process evaluation and focuses on identifying and explaining the challenges of programme implementation. 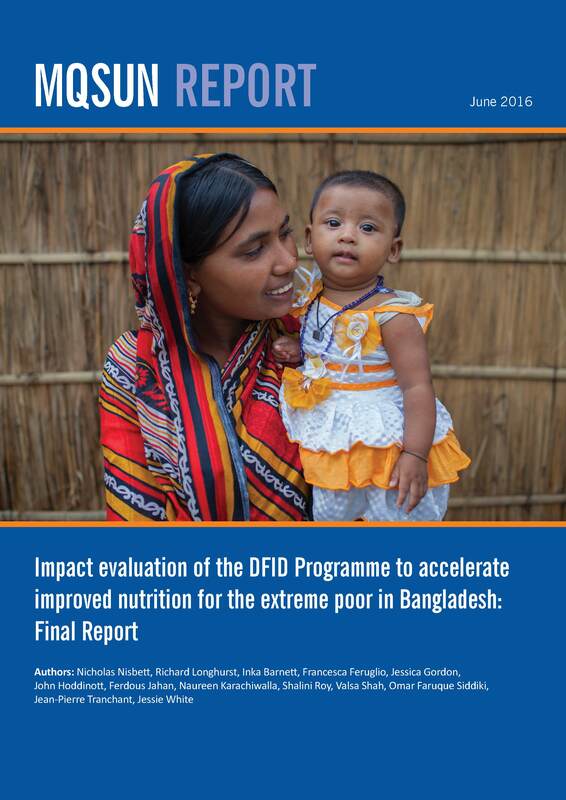 Interestingly the impact evaluation showed no significant change in stunting or wasting, the two most commonly used measurements of malnutrition. The report offers insights around social and economic context, and the design and delivery of counselling on nutrition-related behaviour change, which are considered important for future programming in this area. The report finds that greater attention should be paid to how behaviour change occurs in poorly resourced community environments and suggests how programmes can best drive such change.